At StoreMoreStore we are running a special on both hand gun storage boxes and rifle storage boxes for your weapon evidence storage needs. Our sale includes two sizes, 1) hand gun storage boxes, 13” long by 8” wide by 2” deep, and 2) rifle storage boxes, 48” long by 7” wide by 2” deep. These evidence storage boxes are manufactured by Evident, and available while our supplies last. Evident Weapon Storage Boxes are constructed from white corrugated cardboard and feature locking tabs that keep the lid securely closed. Because your important evidence is stored in a secure box, it limits the amount of people touching the guns, which maintains the integrity of the evidence. 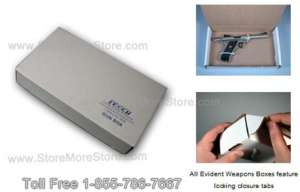 Now you can safely secure, store, and transport hand guns and rifles from the crime scene to the lab or courtroom knowing your evidence has been properly maintained in an Evident Weapon Storage Box. Another benefit of keeping weapons in evidence boxes is that they are easier to store on your evidence room shelving. 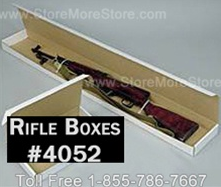 Weapon storage boxes organize and label hand guns and rifles for easy and quick retrieval. You can use your shelf space in a more efficient way because the storage boxes are consistent in size and shape. Property and evidence management is a critical aspect of law enforcement. Properly storing weapons and guns in a well-managed and organized property room is important in order to maintain the integrity of case evidence. Hand guns and rifles are a part of the evidence accumulated by police officers and they can be some of the most difficult items to store because of their odd shapes. Using Evident Weapon Boxes is an easy and efficient way for law enforcement to store the hand guns and rifles they’ve collected as evidence. 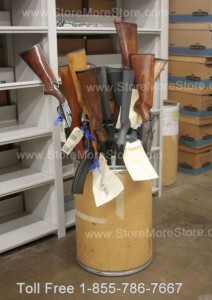 Visit StoreMoreStore.com today to save money on your new weapon storage boxes!